Pre-heat oven to 180 °C, 350 °F, Gas Mark 4. Place the bread in a food processor and blend into fine breadcrumbs. Stir in the chives and lemon zest. Spread the salmon fillets with a thick layer of Philadelphia and place on a lightly oiled baking tray. Top with the flavoured breadcrumbs, lightly pressing them into the Philadelphia. Roast in the oven for 20 - 25 minutes or until cooked. Meanwhile, cook the new potatoes in boiling water until tender. 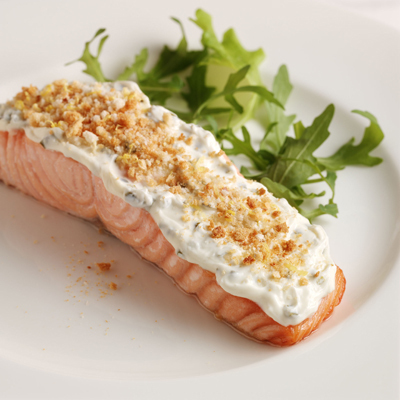 Serve with the salmon, salad leaves and slices of lemon (if desired).